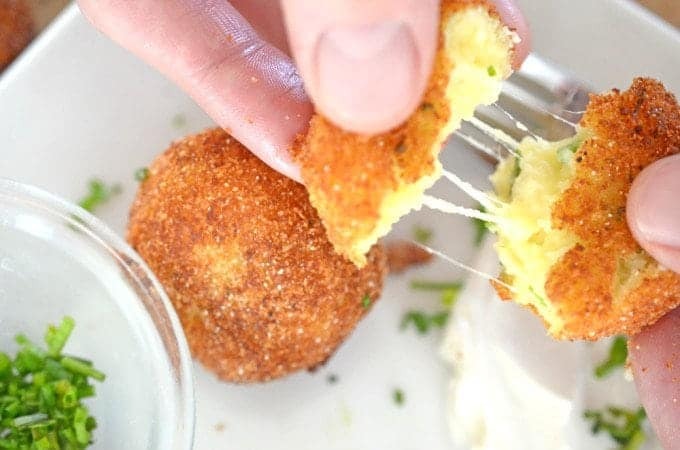 Mashed Potato Croquettes are the stuff from which dreams are made. Soft, warm, comforting and the perfect use of leftover mashed potatoes. 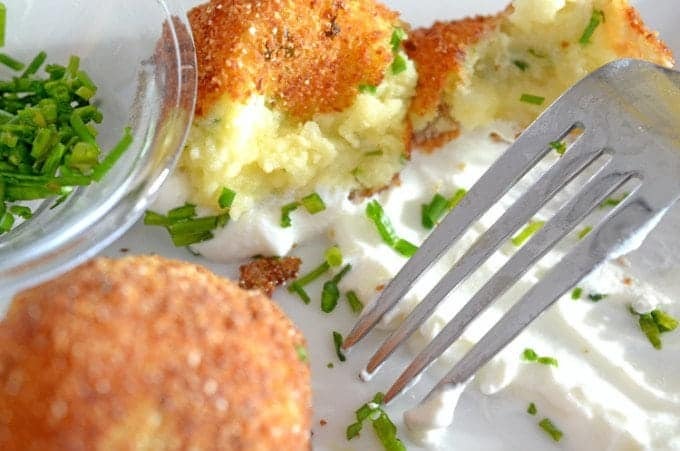 Croquettes are the perfect use for leftover mashed potatoes. Don’t judge me, that’s how I’m wired. 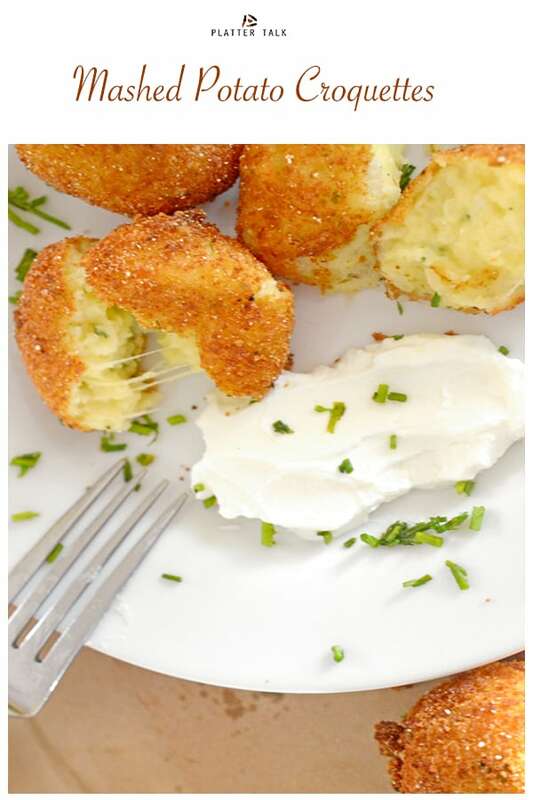 I saw this Mashed Potato Croquettes Recipe in Bon Appétit a few weeks ago, and like most recipes that capture me, this one lived up to my expectations. Every once in a while a recipe catches my eye that I can’t stop thinking about. Almost like love at first site. Often I’ll think about such a recipe for days. I’m not going to lie, sometimes I dream about them. If you have ever asked, “What is a croquette?” you’re not alone. A croquette is nothing more than a main ingredient that is rolled in breadcrumbs and then fried or baked. 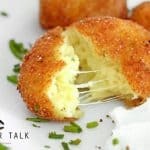 Make Croquettes from these Leftover Foods! 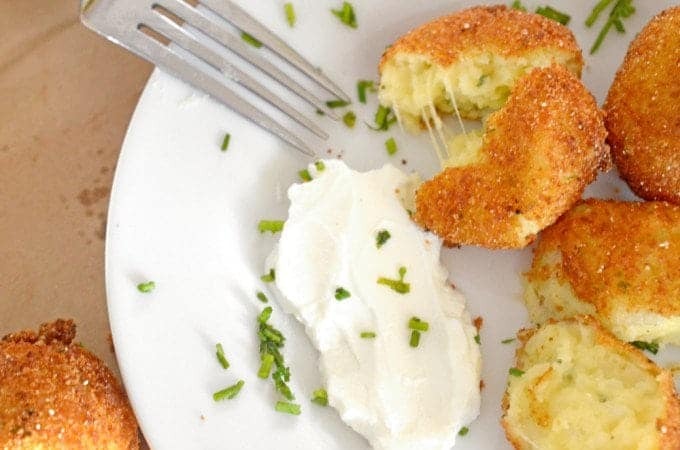 Sour cream is a great compliment to any croquette. Mashed potatoes are a big part of Thanksgiving and leftovers are a big part of Thanksgiving. I think I can remember once in my life when we probably could have used more mashed potatoes at a holiday dinner. I resolved to never make that mistake again. Really, how can you have too many mashed potatoes for any dinner? Croquettes are great party appetizers. This croquette recipe will live up to your expectations, and beyond. Easy to make and delicious use of leftovers, the taste and texture of these croquettes is the stuff that dreams are made of! These croquettes are warm, soft and pillowy on the inside with a light, crunchy texture on the outside. Lightly crunchy on the outside, they are soft on the inside. In the middle of it all, the authentic mashed potatoes, chives, and Parmesan cheese have a little party. These mashed potato croquettes are a celebration of flavor and texture. 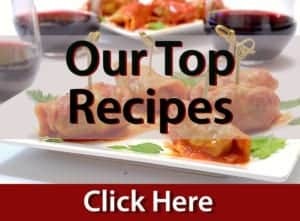 See all of our delicious Leftover Recipes from Platter Talk. 1 cup fine bread crumbs Italian flavored if you can find. In large mixing bowl, combine potatoes, chives, egg yolks, Parmesan cheese, and flour. Mix thoroughly and roll into golf ball size portions. In small bowl beat 2 eggs. Place bread crumbs in another small bowl. Dredge croquettes in egg and then bread crumbs. Heat oil over medium-high heat, using 10" skillet. Working in batches, place croquettes in hot oil, using teaspoon to turn and brown evenly. Remove portions from oil when golden brown, about 3 minutes. Allow to drain on brown paper bag. Serve warm with optional sour cream and additional chives. Love it!! -these are the best things since mashed potatoes came about! Wishing you a very Happy New Year boys!! Thanks so much, Ladies! Wishing you and yours the very best for the new year ahead! That’s so awesome to hear! Thanks for the nice feedback, Amy and we are happy you enjoyed this croquette recipe! This will be a great one for family dinners. We love potatoes in any form and this has to top the list. Love the beautiful brown crust with cheesy inside. 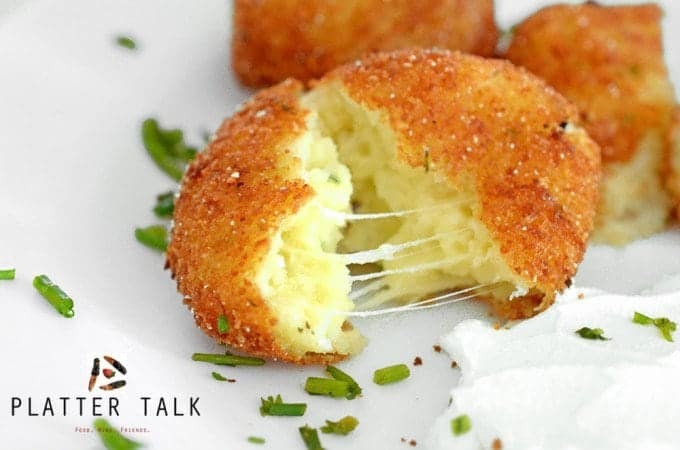 These perfect appetizer for gathering or parties, I am going to try it, my kids will love anything with potato. Your croquettes look absolutely perfect, Dan! I haven’t made them in a while and it’s a perfect dish to make with leftover mashed potatoes. I have to make these! My boys will love this. It’s crispy and super delicious. I must give this a try. I love how you used italian herbed bread crumbs. These potato croquettes look totally divine! That cheese! Everyone in my family will love these! THIS is what I need right now!! Mashed potatoes are my favourite part of Thanksgiving.So this would be right up my alley! We simply love potatoes in any form. But the way you present them — as croquettes– is simply superb. This dish would make an excellent side with any other protein. Will be making them for Hubby. He loves his potatoes too. I love mashed potato croquettes so much. There is a burger place here that has these on the menu and my kids always feast on it. Looks so good. mmm, mmm, this is reason enough to make enough mashed potatoes to have a whole bunch left over. I mean, I can plan left overs, right? These are absolutely beautiful! I have a container of leftover mashed potatoes from Thursday, and I know exactly what I am going to me making with them! I know that feeling when you see a recipe and can’t stop thinking about it! Definitely something that happens to me often. 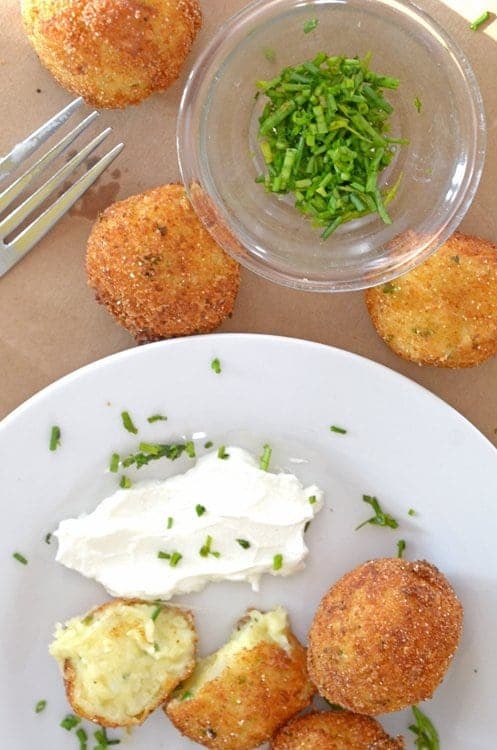 And these mashed potato croquettes are my favorite type of an appetizer! I always order them when I am out. I can make them at home NOW! I LOVE potatoes and I KNOW I would love these. Perfect as a side, or appetizer for all the holiday parties that are just about to happen. I have to say that all the potatoes from Thanksgiving are gone but these look so good I am making more just to try them~ next time I am making extra wow! Oh I totally dream about food, too! Especially really delicious ones like this. I’m so glad I made this – SO good!! These look like the ultimate in comfort food! They actually remind me of an Italian dish we make, Rice Balls, except done with potato instead. I would love to try these for a gathering! Thanks for stopping by, Melissa! These are tailor-made for the days following “big mashed potato days”, such as Thanksgiving. 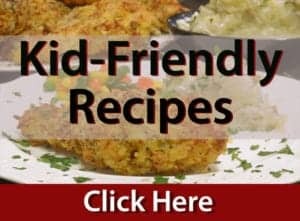 They’re a fun and delicious way of recycling mashed potatoes and I hope you give them a try! Challenged at bedtime to transform this fabulous recipe to a vegan delight (Checked my text messages after “lights out”). Could not resist checking it out online. I will report back, but I think I can meet the challenge in every way EXCEPT to mimic the stringy cheese, with the vegan “cheeses” I now make.